Just in time for fall foliage hiking, the best time of year for waterfall treks! 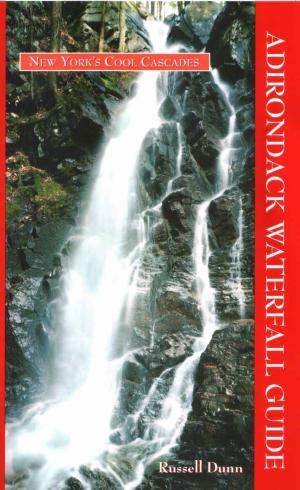 Over 70 eastern Adirondack waterfalls await discovery in Adirondack Waterfall Guide: New Yorks Cool Cascades. From roadside views to wilderness treks and canoe paddles, author Russell Dunn has selected waterfall adventures for every ability level based on twenty years of research and exploration. Easy-to-follow directions, maps, vintage postcards and line art accompany the text as it guides the reader to one cool cascade after another in the Lake George and Heart Lake regions, through Wilmington Notch and along the East Branch of the Ausable River, the Adirondack Northway, the Sacandaga River, and the trails to the high peaks. The author augments his descriptions of many of the waterfalls with the history surrounding the sites. I thrill at the discovery of a wall of splashing water and dripping mosses, where an Adirondack stream takes a sudden, rocky step closer to its final destination. I can sit beside a secluded cascade for hours, with the constant sound of rushing water drowning out all concern for the workaday world. When I camp near a waterfall, its sound sometimes incorporates itself into my dreams, reappearing to me in unexpected ways. It is the experience of discovering the unexpected that I treasure most about Adirondack waterfalls, and the fact that there are still such places to discover in New York State in the twenty-first century is no small thing. I know where I will be next April. Let the pages of this book guide you to many a cascading mountain stream as well.